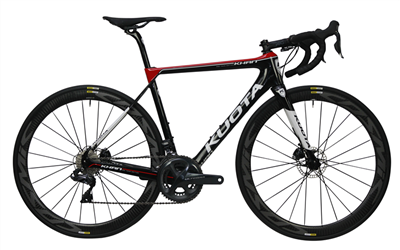 Kuota disc road cycles offer a huge range of road bikes in a large range of sizes. The 2019 offering includes all models now available in disc with the new flagship Kougar Disc and updated Squadra colour in the ever popular Kryon Disc. Each model is available as a frameset or as a complete bike with a range of groupset, wheel and finishing kit options. All of this means that it's possible to get a perfect fitting Kuota road bike for you at a price that suits your budget too. Kuota frames are all carbon so these bikes offer a great way to get a carbon road cycle at lower prices than most brands and there's no compromise on quality either. Northern Ride is a dealer and stockist of Kuota UK. Kuota as standard offer customisation on groupset, gear ratios and finishing kits including wheels. Contact us with your exact specification requirements. In 2019 the revered Cofidis professional cycling team will be riding Kuota bikes in all of the major spring classics and grand tours including the Tour de France. Bike Fit: Each bike will receive a complimentary Bike Fit if collected looking at foot/pedal interface, knee alignment, saddle height, saddle fore-aft and reach. Components will be altered during this if required as part of our service.